Jeep has yet to provide us with a pickup version since the Comanche truck that ended its solo reign in 1992. However, thanks to the conversion-geniuses over at Chrysler and Mopar, the dry spell is finally over! The JK-8 Jeep Wrangler Pickup conversion kit by Mopar is the perfect combination of a Jeep's classicly rugged style with the extra advantage of a truck's practical versatility. 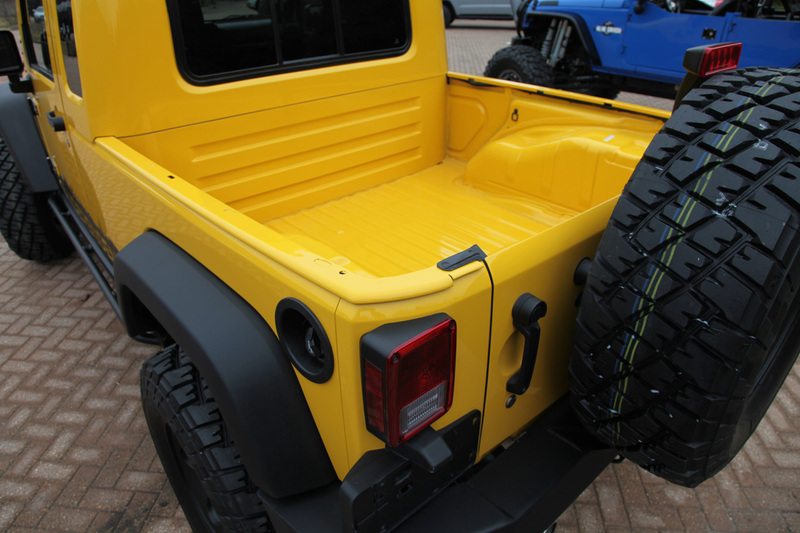 The JK-8 kit transforms any 2007-2011 Jeep Wrangler Unlimited into a pickup with a 50 by 44 inch pickup bed. The conversion kit's suggested retail price stands at $5,499, a decent price to pay for a unique Jeep-truck hybrid. The built-to-order custom kit comes in removable and permanent versions, which is great news for the flip-floppers of the automotive community. While the removable weld-free version can be self-installed in the course of a single weekend, the more heavy-duty permanent version will take anywhere from 12 to 16 hours of body shop work. What do you think of the Jeep Wrangler Pickup? For all you Jeep purists out there, what do you think about this conversion kit? Update: Since Mopar announced the new kit, we created our very own! For pictures and a video about the conversion process, click here for the new JK-8 blog post. Chrysler have made a lot of development with its wrangler fleet! The truck is very simple in design but when you look at its modifications, like the lifted suspension. The vehicle is very much ready to conquer any rough terrains. If you visit here Jeep Cherokee evaluation, you will have the ability to see that the Jeep Cherokee has neat measurements that are in fact fantastic for tight path, parallel parking along with dicing through heavy traffic traffic. Tonneau trucks or cargo trucks needs to protect from thieves, best roll up truck bed cover can save fuel economy as well as protect from harsh weather. Hello, It's Amazing & Magnificent Car. If anyone want to Buy Car Cover, Click here for visiting our Site.